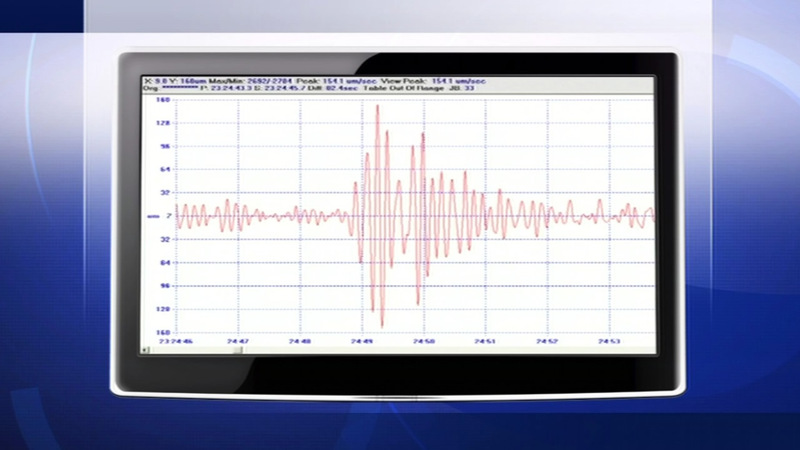 SAN RAMON, Calif. (KGO) -- Another series of earthquakes struck late this afternoon and are continuing to rattle San Ramon, including the strongest yet in the recent swarm of quakes. A magnitude-3.5 temblor struck around 4 p.m. It actually hit just six seconds after a weaker 2.8 quake struck, initially leading the U.S. Geological Survey to believe it was measuring identical twin earthquakes. An even weaker one, measuring 2.5, hit just at about 5:45 p.m.
A 2.9 and 2.8 earthquake struck at 9:33 p.m. in less than a minute. There have now been over 200 quakes in the past week. The largest is that 3.5. All were centered around San Ramon on either the Calaveras Fault, or off-shoots of it. While seismologists still say that swarms such as this are not unusual and not cause for any extra concern, they are starting to worry residents. "It's enough to where I am thinking about calling to get earthquake insurance," said San Ramon resident Karen Alvarez. Dublin resident Jorge Valle adds, "You just feel the house move a little bit and you think about it like, 'Oh man, that was an earthquake!'" Click here to see all the recent quakes that hit here in the Bay Area and around the world. And click here for tips from Prepare NorCal to get ready for the next big one. Did you feel it? Share your experience by tagging it on Twitter, Instagram, or Facebook with #abc7now. Another East Bay #earthquake. I actually heard it before feeling it. @abc7newsBayArea Eathquake in San Ramon...power out! @abc7newsBayArea our windows shook in Orinda. Didn't feel it but heard the Windows moving. @abc7newsBayArea I felt a very short jolt in Concord.